We all love beautiful strong nails and moisturized soft hands. Unfortunately, this is one of the most exposed parts of the body and thus, cold weather, often hand washing and poor hand care can lead to unpleasant conditions. Let´s name some: brittle and weak nails that peel and split as well as dry, cracked and damaged cuticles, cuticle infection and cuticle pain. Pulling cuticles can be very tempting but it can lead to pain, bleeding and infection. Using essential oils for brittle nails and dry cuticles is a great way to strengthen your nails and treat any cuticle problems. Rose oil has a special connection to the heart and is widely used in the cosmetic industry for its skin nourishing effect as well as in perfumery. Its lovely floral scent feels like a warm cuddle whenever I use it topically or for inhalation. This oil come comes from the damask rose petals and has been traditionally used for skin nurturing. It has moisturizing and nourishing properties, and that is why it works well for cuticles, skin irritation, dryness and mature types of skin. For a lovely smelling natural oil that moisturizes dry cuticles and nourishes splitting and peeling nails, add 4 drops of rose oil to 1 tbsp. of jojoba oil. Essential oils should always be diluted before skin application and jojoba carrier oil is great for moisturizing cuticles. In addition, and according to a 2009 study, when rose oil is absorbed into the skin, it has a relaxing effect on people. So, while pampering your hands and nails using rose oil, you will feel emotionally more calm and relaxed. Isn´t this a lovely nail spa-like experience you fully deserve? Bright and energetic, vibrant and delightful, lemon oil is a fruity oil which has a stimulating and toning effect. Like all citrus oils, it is high in monoterpenes, which gives the oil antiseptic, antibacterial, antiviral and anti-inflammatory benefits. Its antiseptic properties make lemon good for cuticle infection while its anti-inflammatory qualities can help relieve cuticle pain and heal damaged and cracked cuticles. The lemon essential oil has also been traditionally used for strengthening brittle nails due to its stimulating benefits. It also works as an excellent natural remedy to whiten nails and make them look more healthy and toned. For a revitalizing DIY natural nail and cuticle treatment, dilute 3 drops of lemon oil into 1/3 teaspoon of natural hand gel and add it to a bowl of warm water. Soak your fingernails in the water and remove after 5-10 minutes. Citrus oils are very vulnerable to air and light and they have a short shelf life of 6 months after opening. Old oils can cause skin sensitization and the best way for me to avoid this negative reaction is by putting a sticker on the bottle which reminds me of the exact date of opening. Raisin essential oils such as Myrrh have been used for thousands of years and been admired for their healing properties. One of Myrrh´s chemical constituents is Sesquiterpenes which offer the oil great anti-inflammatory and antiseptic properties. Myrrh essential oil has been regarded over the years as a wonderful skin healer, which makes it one of the top essential oils for hands and healthy nails.It is also known for its anti-inflammatory and skin healing potency in case of skin injury. These qualities make myrrh oil a very useful natural remedy for healing damaged cuticles and strengthening weak nails. For a deeply healing and skin-repairing DIY natural cream for hands, nails,and cuticles, mix 50 ml. of an unscented cream base with 15 drops of myrrh oil. The scent of myrrh is also uplifting and deeply relaxing, which is an additional benefit. Just a word of caution. Do not use myrrh oil if you are pregnant because it is a uterine stimulant. Also, avoid using whilst breastfeeding. Geranium is such a versatile essential oil with multiple uses for both physical and emotional wellbeing. I love mixing geranium oil with Camellia carrier oil to make a skin regenerative, emollient and moisturizing essential oil blend that softens dry cuticles and strengthens my fingernails. Geranium oil is well known for its circulatory properties and its benefits to dry skin but, according to a 2018 study, it also has antioxidant potential and the ability to prevent oxidative stress, which means that it can slow down skin aging. Can you think of a better way to enjoy anti-aging benefits for your hands and boost the health of your nails? Simply add some drops of geranium oil to your hand lotion and enjoy skin and nail pampering throughout the day. One of my most favorite oils, Frankincense oil is gifted with qualities that have applications in both nail care and skin care. A 2016 study on Frankincense demonstrated significant analgesic and anti-inflammatory effects due to the combination of three active ingredients (linalool, a-pinene,and 1-octanol). These properties can be very helpful in healing peeling and splitting nails, strengthening them, as well as relieving cuticle pain and cuticle infection. This makes Frankincense one of the best natural oils for nails and cuticles. Historically used for mature and very dry skin, Frankincense is also popular for smoothing out wrinkles. For a healing nail and cuticle oil blend, add 12 drops of Frankincense to 30 ml. of calendula carrier oil which is also a great skin healer. Patchouli has a distinct sweet and spicy aroma that is often described as overpowering and is very popular in perfumery. You will either love or hate patchouli, but bear in mind that when the oil dries down to the skin, it smells a lot lighter and pleasant than what you smell directly from the bottle. Apart from its aromatic complexity, patchouli oil has been traditionally used with success for dry skin and is a skin regenerative oil that can be very beneficial for cuticle care. For a lovely DIY cuticle balm with essential oils, mix 20 ml. of natural balm base with 10 drops of patchouli oil. Keep the balm in your bag and give your nails a quick treatment when you are out and the temperatures are very cold. There are many ways to strengthen nails and cuticles with the help of essential oils. Here are some great essential oil recipes for healthy strong nails and cuticles. To make this blend, I use Camellia carrier oil for dilution which is great for nail and cuticle treatment. It has emollient, moisturizing and skin regenerative properties. Put the carrier oil to 30 ml. glass bottle dispenser. Add the essential oils and gently swirl the oils around. Apply to the nail bed and also to the cuticles if you have any. Use 2-3 times a day for treatment. For prevention, you can use it less often. The moisturizing properties of Jojoba oil for cuticles are combined with the anti-inflammatory and skin soothing qualities of Apricot Kernel carrier oil to make this blend very healing. The essential oils, of course, enhance its healing power while the Rose and Patchouli aromas are mixed together to give a very feminine note to it. Patchouli is also used for nail infections. First, add the carrier oils to 30 ml. glass bottle and then the essential oils. ​Swirl the mixture around and let it rest for a while before starting to use it, allowing the ingredients to fully integrate with each other. This a general blend for strengthening weak nails and help them grow. First, mix the carrier oils to create the base oil. Put the base oil blend to a 30 ml glass bottle dispenser. Apply 2-3 times a day to the nail bed, massaging the oil well into your fingernails or toenails. Put 50 ml. lotion base to a glass jar and add the drops of one essential oil. Softly stir until the essential oil is well mixed with the base. Continue adding the rest of the essential oils and mixing them well with the lotion. Use 2-3 times a day or whenever you find it is necessary. Prepare the natural balm base by melting together 45 ml. of Sweet Almond oil, ½ tablespoon of coconut oil and 1 big tablespoon of organic beeswax. For this purpose, you can use a bainmarie. Allow the mixture to cool a bit and then transfer 20 ml. of it to a glass jar with a lid. Add the essential oils to the balm and mix well. Let the balm become cool and solid before using it. There are many external and internal factors that can lead to brittle, peeling and splitting nails as well as dry, cracked and damaged cuticles. 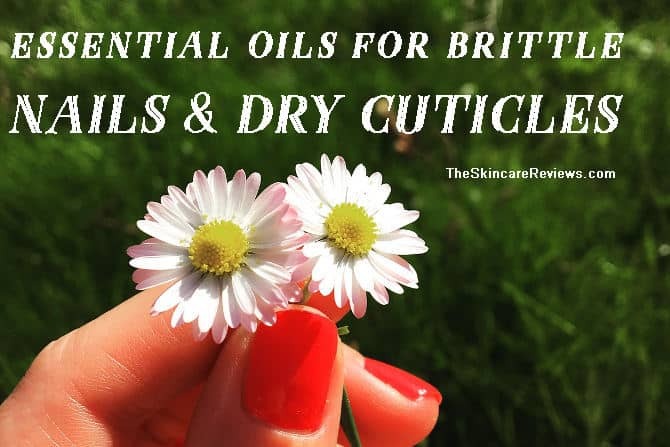 Using essential oils for weak nails and cuticles is a great natural way to strengthen the nails, pamper your hands as well as heal cuticles and prevent cuticle infection. Rose essential oil is great for nourishing and moisturizing the skin, so it works well for cuticles, dry and mature types of skin. The lemon essential oil has antiseptic, anti-microbial and anti-inflammatory properties which can be beneficial in the case of cuticle infection and pain but also to heal cuticles. Lemon oil has also been traditionally used for brittle nails. Myrrh essential oil has anti-inflammatory and skin healing qualities. Therefore, it is effective for damaged cuticles and weak nails. The geranium essential oil is skin regenerative as well as emollient and moisturizing to the skin. Based on scientific research, it has also been found to have an antioxidant capacity and can, therefore, be a useful tool in reducing skin aging signs. Frankincense essential oil has been proven to have an anti-inflammatory and analgesic effect. Thus, it can relieve cuticle pain and help heal peeling and splitting nails. It has also been traditionally used to pamper very dry and mature types of skin as well as to smooth out wrinkles. Patchouli essential oil is used for skin regeneration and is, therefore, a good natural solution for healthy moisturized hands and cuticle care. Some people have also experienced positive results when using it for nail infections. There are various essential oil nail and cuticle recipes you can use including natural oil blends, balms,and lotions. The 6 recommended top essential oils for brittle nails and dry cuticles of the specific essential oil brands above were selected in terms of quality, good brand reputation,andaffordable prices.